Standard 18“ wide half-round recycling receptacles are perfect for use in tight areas and where pedestrian traffic is light. These models have a 14 or 16 gallon capacity and fit comfortably in lobbies, rest rooms, by elevators, in hallways, against columns, meeting rooms, and in other small or light traffic spaces. Optional wall mounting brackets. 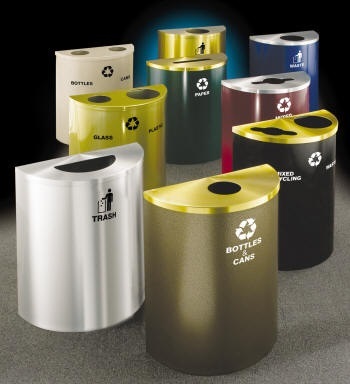 Large Capacity 24“ wide half-round recycling receptacles are perfect for busy pedestrian traffic areas. All models have a 29 gallon capacity. These units are ideal for use in rest rooms, corridors, entrance and exits, vending machine areas, health clubs, by elevators, in hallways, outdoor facilities, and other spaces that require additional trash capacity. Optional wall mounting brackets are available.. 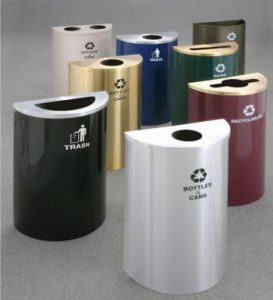 These space-saving half-round recycling receptacles are the product of choice for use against walls, columns, and partitions. Manufactured with steel and aluminum, these half-round, recycling receptacles feature rustproof aluminum bottoms and full width aluminum piano hinged covers. They are specifically designed and finished to match and coordinate with the look and feel of all Glaro product lines to create consistency. This collection consists of a variety of half-round recycling receptacles. All products are manufactured in the U.S.A. by Glaro Inc. Choose from six models: Models with hinged tops include: (1) an attractive and stylish half-round opening that match the covers’ shape primarily used for trash, (2) a 5.5″ diameter round opening primarily used for bottles and cans, (3), a 2.5” x 9.5” slot primarily used for paper, (4) a multi-purpose round hole centered on a wide slot primarily used for paper and bottles and cans, and (5) dual purpose top models with two openings. (6) An economy open top model is also available. Download a brochure of our 18” models now. Download a brochure of our 24” models now. Maximize available space and keep floors easy to maintain. All models are easily mounted to the wall with Glaro’s optional wall mounting bracket. Glaro always provides a choice from its large selection of messages. The message “waste “ is provided without the recycling logo whereas all other recycling related messages are supplied with the international recycling logo. In addition a custom message, logo, or graphic can easily be applied to any Glaro product for a nominal fee. Our graphics department can assist you with the art work and submit a proof for your approval. Be assured that every Glaro product may have a long lasting quality silk screened message/logo that is baked on to withstand years of cleaning and exposure. Labels and decals are never used on Glaro receptacles. Solid aluminum models are available in clear baked powder coated satin aluminum (SA), or tarnish proof satin brass (BE). Galvanized steel models with aluminum covers are available in 29 textured and smooth powder coated finishes with a choice of satin aluminum (SA), tarnish-proof satin brass (BE), or a matching powder coated finish for the hand spun aluminum covers. An attractive customized look can easily be accomplished from this large selection. It’s easy to obtain a customized look by choosing the same or a different finish for the top cover and the body to obtain the optimal “look” that satisfies the eye. In addition, these products will coordinate and match beautifully because the same 31 finishes are available across the various Glaro product lines. Authentic color samples are available upon request. A color chart may be downloaded here. Please keep in mind that colors shown may vary from the actual colors. An attractive customized look can easily be accomplished by choosing from the broad selection of finishes. It’s easy to obtain a customized look by choosing the same or a different finish for the top and the body. In addition, these products will coordinate and match beautifully because the same finishes are available across the various Glaro product lines. Download the half round receptacles brochure for full specs, photos and design options on all Glaro half round “Profile” receptacle models. Glaro customer service and sales representatives are available to discuss your specific recycling and waste receptacle needs. They can help you determine the most suitable receptacle for your application. Please contact us at 1-888-234-1050 today. Back to the category page on Recycling Receptacles.